This series has been very polarizing as people either love the intensity and scares, or they just can't stand the "found footage" type of film making. Either way, the first two movies have gone on to become huge hits at the box office. 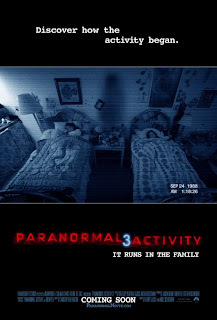 Each being made on a shoestring budget and raking in millions of dollars has guaranteed that we will keep seeing Paranormal Activity during the month of October for years to come. How long can the story be milked? This third installment leaves some the history untold and may eventually branch out from Katie and Kristie's family. At the beginning of part 3 we see Katie visiting her sister and brother in law before the birth of their son and well before the demon starts to do his thing with either of the two couples. She asks if some of her things can be stored in their basement including a couple boxes of stuff she has been keeping for many years. Kristi's husband Daniel sees a collection of old VHS tapes in one of the boxes that have titles showing birthdays and other events from the sisters' childhood days. The movie makes a few quick cuts through the events of the part 2 including the day they thought their house was broken in to which inspired them to set up the security cameras we see throughout that film. This is important as Daniel makes mention that nothing was missing from the basement except for Katie's box of VHS tapes. Of course nothing is thought of this at the time as they had no idea what was really on those tapes. From there we begin to see VHS tape footage from the late 80's of Katie and Kristie along with their mother and step father. Things of course start out normal, but as the footage continues, we see Kristie begin to speak to what they think is Toby, her imaginary friend, some times while awake and some times in her sleep. Thus begins the demons original torment of the girls and their parents that was briefly talked about in parts 1 and 2. For the most part, we see new twists on the same bag of tricks used on the first two films. Long, quiet moments that lead up to big bangs or other types of scares. We see the demon progressively get more and more active as the family tensions feed its aggressiveness. I like how the writers find at least somewhat passable reasons for the continued use of cameras throughout these films. The girls' step father Dennis films and edits wedding videos so he has a thorough knowledge of cameras and is the one that first sees that something isn't quite right in the house. Two of the best pieces of footage involve times when the parents are away from the house and we see a babysitter and Dennis' friend each become involved in the demon's antics. A camera set up on the base of an oscillating fan also creates some great visual moments as it pans back and forth from the living room to the kitchen. Of course, I won't be revealing any of the scary details here, but rest assured there are several jump out of your seat moments with tension filled build-ups that keep you on the edge of your seat. The pacing of this movie, just like its predecessors, can be slow and methodical as we dig through all of this "raw" footage, but the high points are well worth the wait. What works here is that, even though we know we are watching a work of fiction, you still get drawn in to this footage as if it was video of real people going through these extraordinary events. You can't help but find yourself gripping the arm rests of your theater chair while someone slowly walks up a flight of stairs or jumping when a door slams unexpectedly. As I mentioned before, the movie ends up taking us down a path that opens the door for a much more expanded story as more of the history of why these events are happening is revealed. Hopefully the writers of this series are still able to find creative ways to keep using the "found footage" format, otherwise they may just have to take the whole paranormal concept in a new direction. Either way, there is enough story here to keep things going for quite a while.